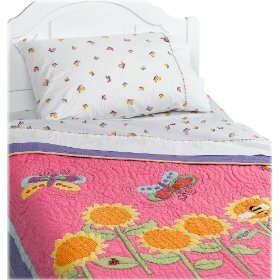 The Pike Street Fall Garden Quilted Bedspread comes in three different sizes to fit full, queen, or king sized beds. A light cream color, this quilted bedspread is accented with a dainty floral print, embroidery and Vermicelli stitching. Although the price of the quilt depends on what size you buy, all three bedspreads generally sell for less than $300 and compliment other bedding, such as pillow cases to match it. Through our research, we found that a whopping 100 percent of those who reviewed the bedspread on Amazon.com gave it four or five stars. Many customers were very impressed with the design and feel as though the product they received after ordering it online was exactly what they had wanted and expected. Those who had had trouble in the past finding quilted bedspreads to fit their larger-sized beds were pleased that the quilt was oversized and not only comfortable, but looked nice on a made bed as well. 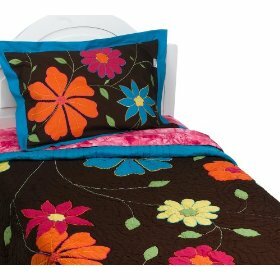 Though the Pike Street Fall Garden quilted bedspread is a bit pricey, customers believe that the price is worth the quality of the product. According to many consumers, the embroidery holds up well and the stitching is very high quality so the quilt is incredibly durable. The only negative comment we found in our research was that the bedspread was packaged so tightly in plastic that it smelt bad when it arrived. However, customers found that after they ran the quilt through the wash a couple times, the smell was gone and the bedspread was still as beautiful, soft and durable as it was before the wash.
Buy Now the Pike St Fall Garden Quilted Bedspread? The Freckles Hot Chocolate Quilt is very popular with teens and tweens and is available in twin, full and queen sizes. The cover is quilted and has a dark hot chocolate background adorned with flowers in shades of orange, magenta, blue, and yellow flowers. The green stems and leaves gently curve amongst the flowers. 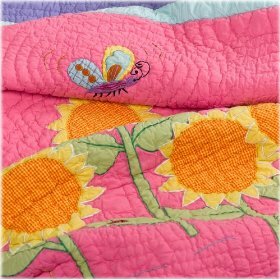 The big showy flowers are detailed and outlined with decorative stitching and is hand quilted to heirloom quality. The Freckles Hot Chocolate Quilt has a bright sky blue border that trims the entire quilt which was designed in Australia. 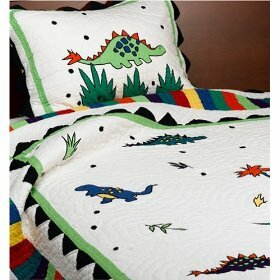 The quilt is made from 100-percent cotton and has a 100% cotton fill so it can be machine washed and line dried. There are a lots of bright, funky coordinating accessories to create an entire teen dream room, including curtains and valance, lampshade and cotton rug, even accent pieces such as a photo frame, notebook, and trinket boxes. Where Can I Buy the Freckles Hot Chocolate Quilt? A great looking quilt in bold pinks and blacks will make this Hannah Montana Pop Rock Quilt a favorite with the Hannah Montana fans in your household. Regardless of how parents feel about the latest pop rock sensation, the majority of tweens just love her and they will definitely think you are the coolest mum if you give them the Pop Rock quilt. It comes in both twin and full size and it will keep your rock star cozy in the cooler months. 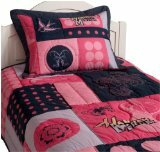 There are a range of matching accessories for this decorative cotton quilt such as this matching Hannah Montana Pop Rock Quilted Sham . After all if you are going to get the quilt you might as well have the pillow sham that matches. Other items to complete the look are the Hannah Montana Part Time Rocker Sheet Set and there is also a set of drapes (which are currently out of stock). The sheet set is available in queen, full and twin sizes and they are 60/40 percale with a 180 thread count. The pink and black theme is carried through and the sheet set will coordinate beautifully with the quilt and padded pillow sham. Where Can I Buy The Hannah Montana Pop Rock Quilt – Twin/Full and Accessories?